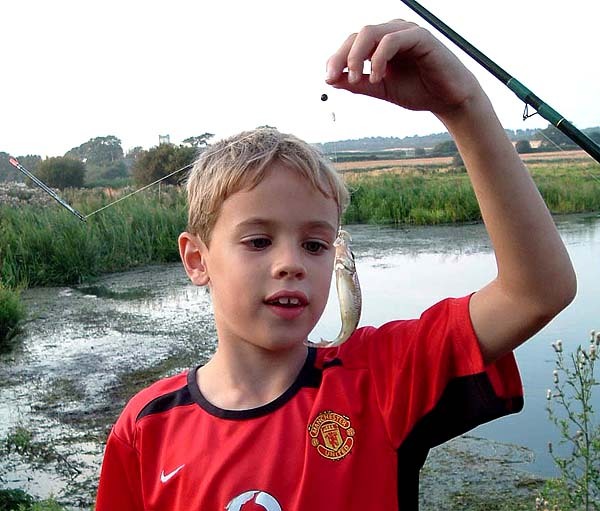 My grandson Ben (now 19 years old and 6'2" in height) used to go fishing with me quite often when he was younger. He's caught quite a few fish from pike to pollack and rudd to wrasse so he knows how to cast and how to play fish. As he grew up the opportunities for fishing with me diminished but clearly the 'bug' is still with him because recently he's been asking me when we could go fishing. One of the big problems is actually organising trips as he lives a good half-hour's drive from me and most of my sessions these days are very short. Anyway, the other day, we were over at Ben's. I asked him if he fancied an evening at the beach and he jumped at the chance. We drove over to our place, had a quick bite to eat, grabbed a couple of rods, took a pair of mackerel fillets out of the fridge and set off. Of course Ben has no waders so we were restricted to somewhere we could fish in wellies. 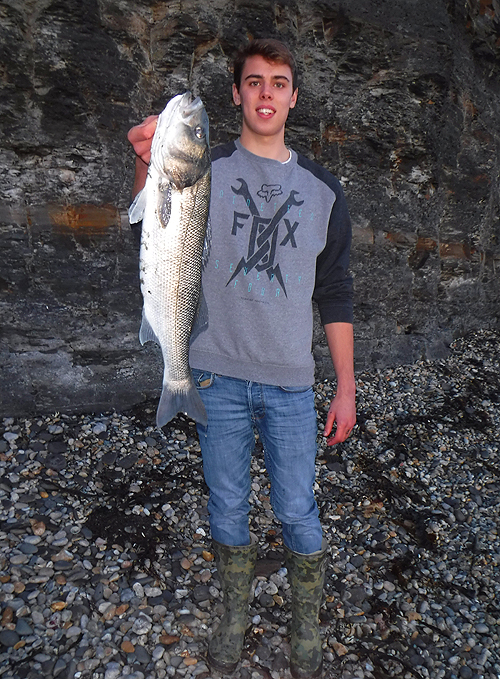 Fortunately the sea had fallen calm and there was little wind so I decided it would be worth trying freelined baits. Time was pressing so long walks were out of the question and we opted to try close to where we parked the car. He'd never used the free-lining tactics before so I showed him how to bait up the 6/0 circle hook with a flank fillet of mackerel and as we stood two rod lengths apart the baits were flicked two or three metres out to sea. Rods were held, bale arms were kept open and the line was gripped gently between the fingers and thumbs of our free hands. As I commented "It's a bit like carp fishing!" 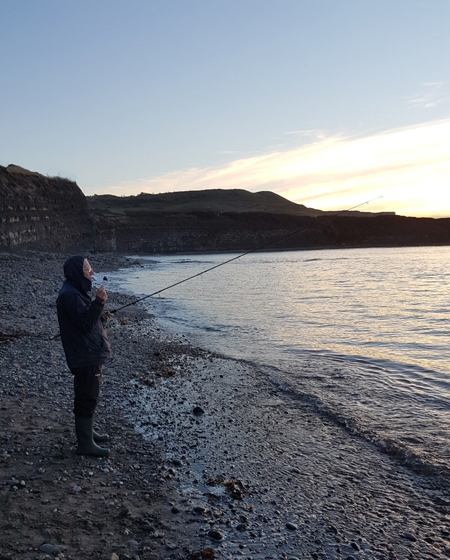 As we began it was still bright, the sun was in the sky and there were quite a few holiday makers on the beach, taking pictures, looking for fossils, throwing stones in the water and generally messing about in a manner calculated to scare fish and annoy anglers. There was still half-an-hour to go before sunset and I thought it was unlikely that we'd get a bite before the light began to fade. We stood chatting about fishing related topics and I said to Ben that, if he had a bite, he should simply let the fish run freely with the bait for a while before dropping the rod tip to give a bit of slack, gently closing the bale arm and then NOT striking. The sun sank slowly towards the western cliffs and as the air chilled the stone throwers, barbecuers and fossil hunters gradually wandered back up to their cars. Now we were alone on the shore with only the gentle slopping of the water to break the silence. Ben said - "I've got a bite!" I moved towards him and I could see the line running out through his fingers at high speed. He followed my instructions to the letter, the braid tightened and then fell slack as the fish dropped the bait. Bugger! He reeled in to find the bait still in mint condition so I told him to lob it out as before. Again we waited. Another five or ten minutes passed and of course we were all keyed up in anticipation of another bite then Ben's line twitched and began to run out again. This time it was going even faster and he waited a little longer before closing the bale. The rod bowed round to his left and the fish was on. At first it didn't pull very hard and he began to lift the rod and turn the handle of the reel but suddenly it was wrenched down as the bass realised it was hooked. There was a huge boil in the water right in the margin. Clearly the fish had run parallel to the shore and stayed really close in, as they sometimes do. Ben walked towards the thrashing fish, reeling to keep a tight line as he went and I watched as, after a bit of a tussle, he slid a fine bass ashore and picked it up. The fish was round about the six-pound mark and since my fellow angler hadn't been fishing for years I said he could keep it to eat. We fished on for a few more minutes but it was now becoming distinctly chilly so we trudged back to the car and drove home well pleased with our hour's fishing. Must go with him again before long. 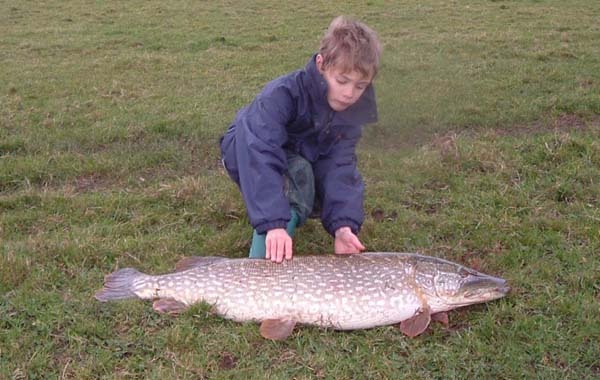 A very young Ben with one of his smaller catches. A better fish for my grandson. 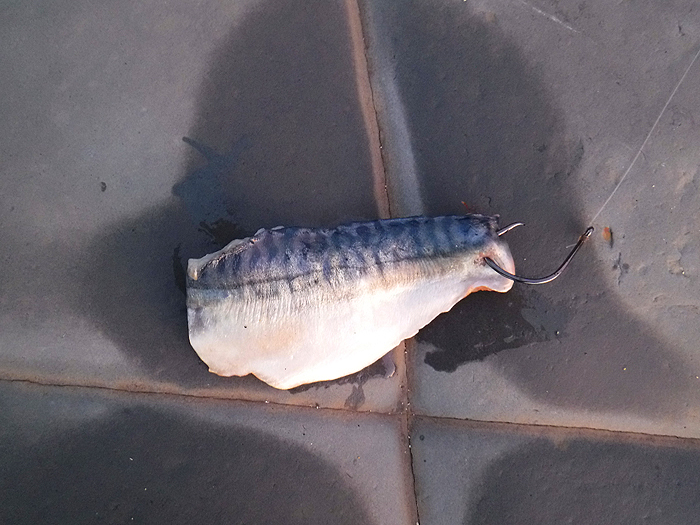 The bait - a lightly hooked mackerel fillet from my freezer. I regard this as a sort of hair rig. I was unaware that Ben took some pictures on his mobile phone as we fished. Not bad for a reintroduction to bass angling.